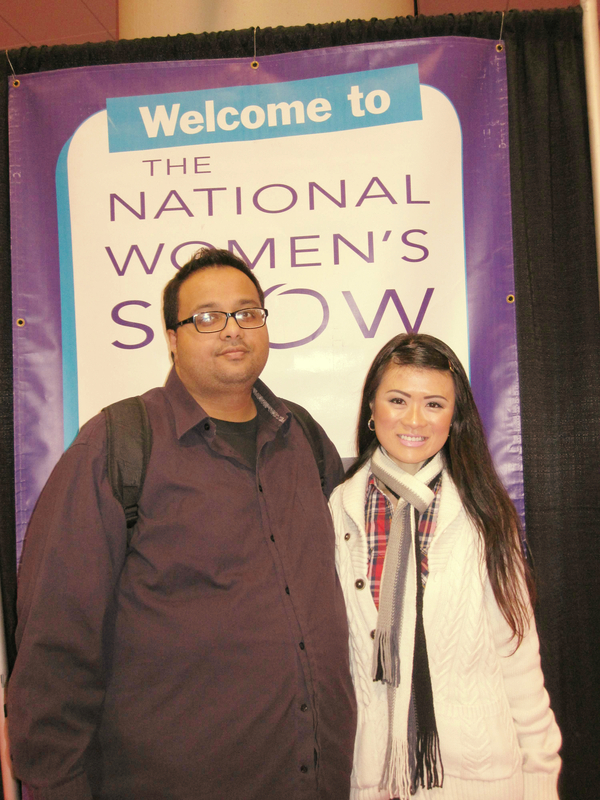 I was so excited to introduce Raj to the National Women’s Show this year! 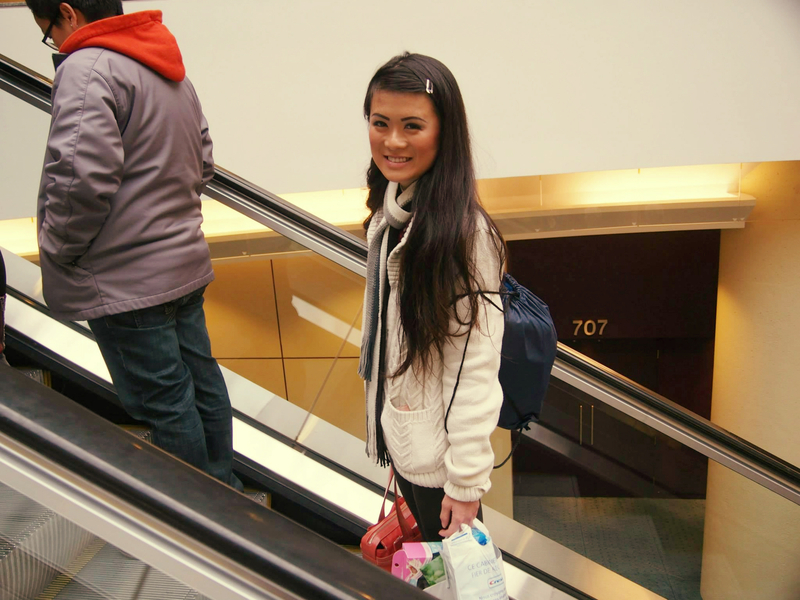 We arrived at the National Women’s Show prepared for hours of walking and sampling! 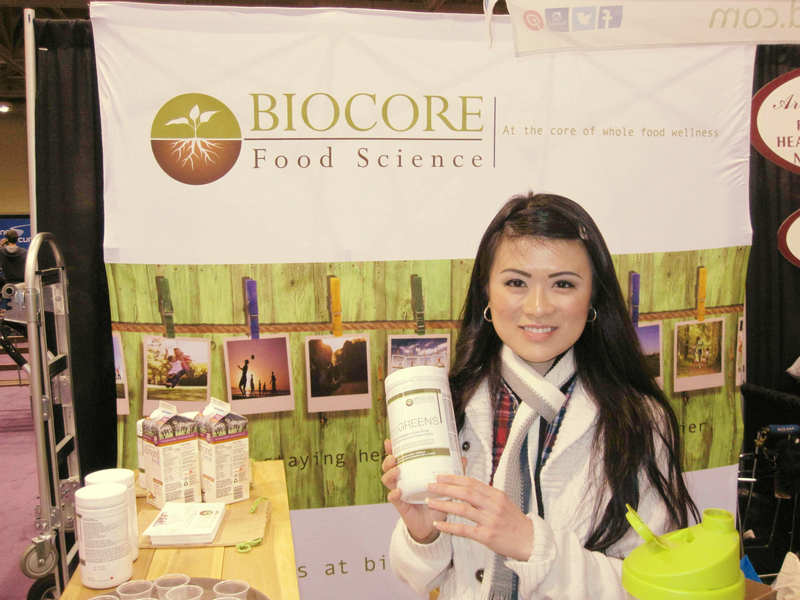 We visited the BioCore Food Science booth and I introduced Raj to their “microGREENS” product, which is one of my favourite tasting greens drink mixes. His response after sampling some: “Oh wow, that was actually pretty good!” Yep. 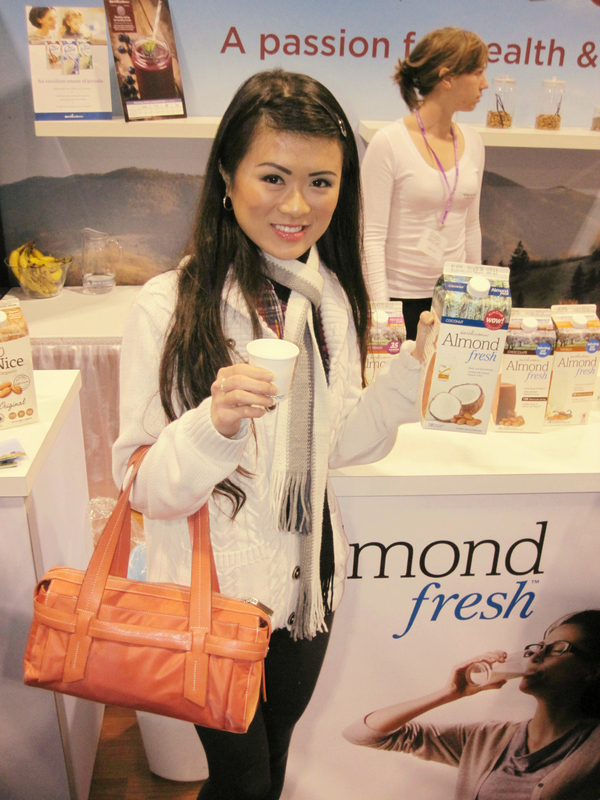 This was my first time hearing about and trying this almond milk company called Almond Fresh. Raj’s favourite flavour was chocolate and mine was coconut. I just wish their chocolate flavoured one wasn’t so high in sugar (21 grams of sugar per cup) and their coconut flavoured one wasn’t sweetened with refined white sugar. However, they do have an unsweetened and unflavoured almond milk, as well as an unsweetened vanilla flavoured one. 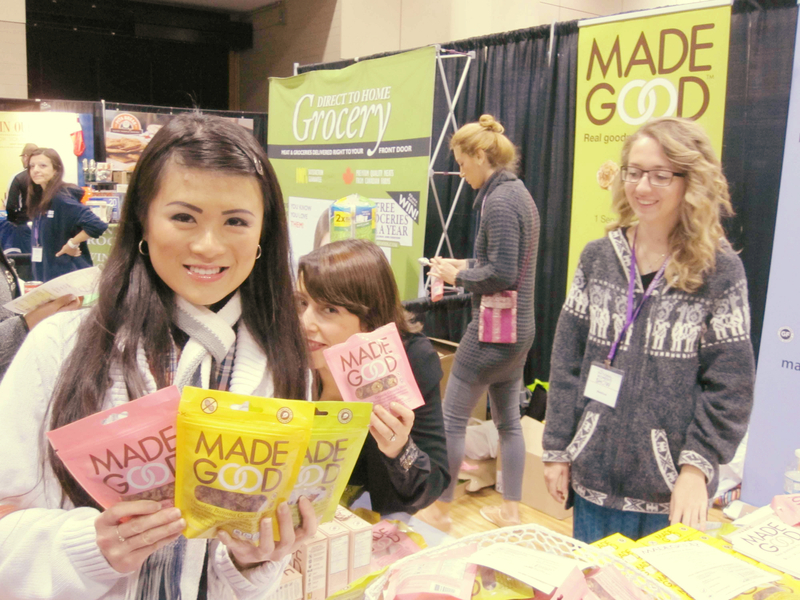 I loved these granola minis by MadeGood, especially the strawberry flavoured ones! Their organic and peanut-free granolas are rolled up into bite-size pieces and they contain vegetables (spinach, broccoli, carrots, tomatoes, beets, and shiitake mushrooms), all of which you cannot taste! It’s always great when you find a tasty way to add a bit more veggies into your diet. 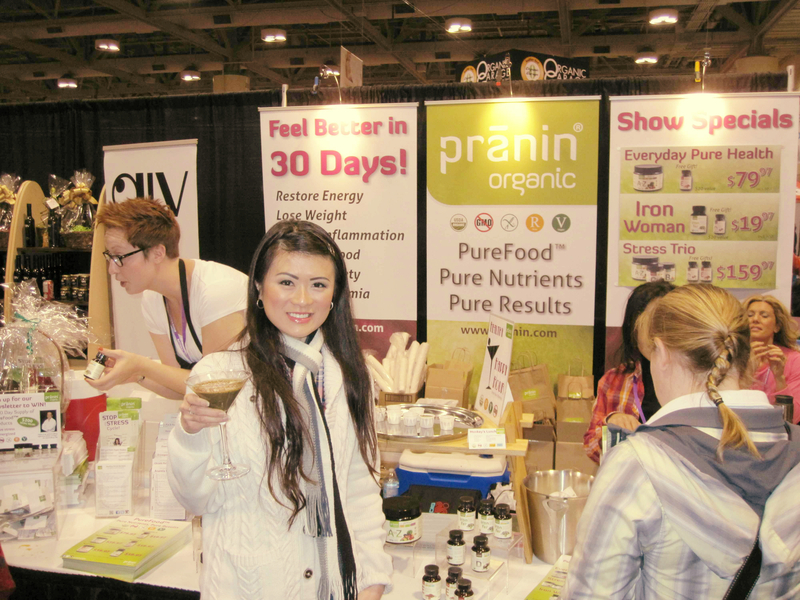 One of my most exciting finds at the National Women’s Show this year was Pranin Organic. Their supplements are 100% organic, non-GMO, dairy-free, corn-free, yeast-free, soy-free, and gluten-free. They are also made entirely from food (so no synthetic nutrients) and they do not contain any binders or fillers. We tried their “PureFood B” (a B-vitamins supplement), “PureFood Iron” (a bio-available, non-heme iron supplement), and “Complete A to Z” (a powdered multivitamin mix). Raj and I were both pleasantly surprised that they all tasted great! I’m not a big fan of fruit juices in general, but I love Van Dyk’s By Nature pure wild blueberry juice. It is made only from grade-A wild blueberries that are grown in Nova Scotia and it does not contain any sweeteners, preservatives, or additives. My favourite way to enjoy this pure blueberry juice is in salad dressings. 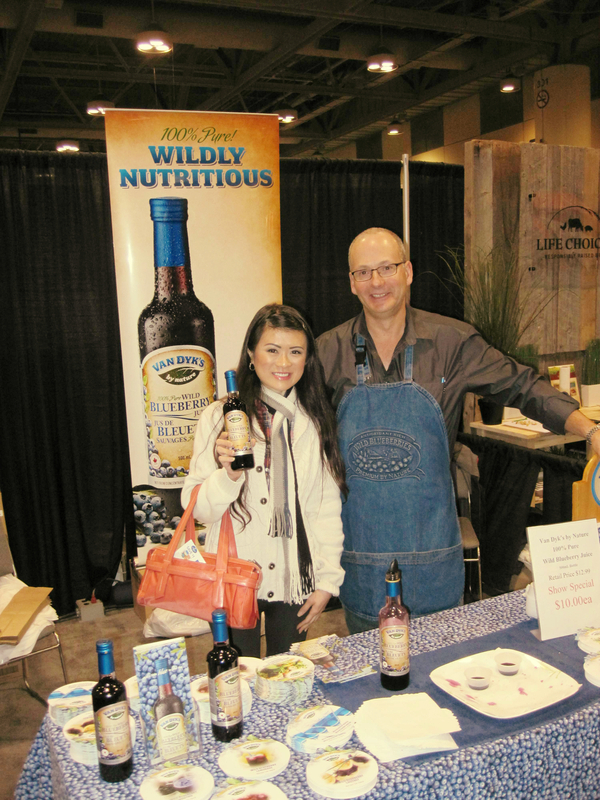 Muskoka Roastery Coffee Company served amazing coffee at the National Women’s Show. There was an unflavoured coffee and a flavoured one at the show. 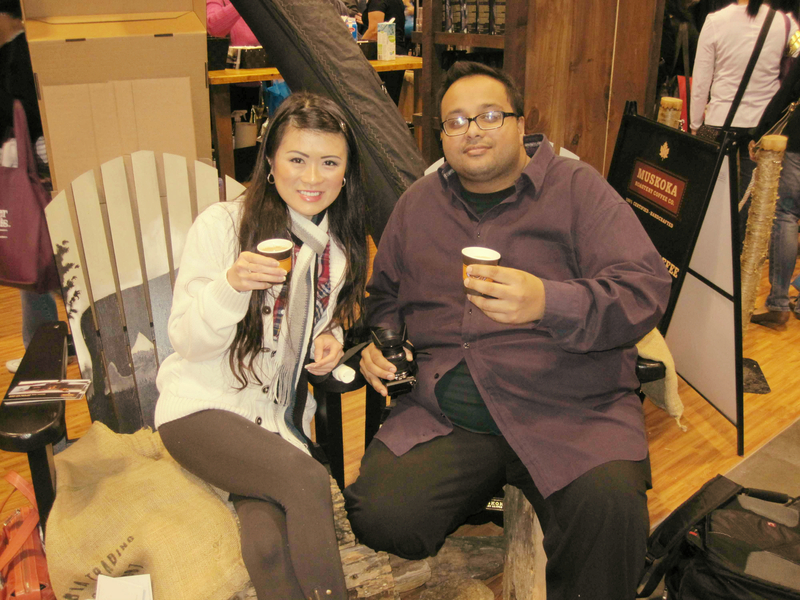 Raj chose their flavoured “Muskoka Maple” coffee and he really enjoyed it. I, on the other hand, strongly dislike all flavoured coffees, so I chose the “Loon Call Breakfast Blend” unflavoured medium coffee and it was delicious! I have friends who swear by the Clarisonic and believe that this oscillating facial cleansing brush should be a necessary tool in everyone’s skincare routine. I have contemplated purchasing it, but I have been skeptical about its effectiveness. However, after getting a demonstration done on the back of my left hand, I have added this beauty tool to my Christmas wishlist! It was so gentle and left my hand feeling so clean and smooth! Imagine the potential skin improvements if I used this brush on my face daily! I sense a Clarisonic purchase in my near future. Raj knows my favourite lipsticks are from Yves Saint Laurent (YSL). So when we spotted a YSL booth at the National Women’s Show, he knew we just HAD to visit. The makeup artist there suggested some products for me to try. He applied one of the new Rouge Volupté Shine lipstick shades on my lips, a complementary Rouge Pur Couture Vernis à Lèvres Glossy Stain lipgloss shade on top, and some Touche Éclat complexion highlighter under my eyes. I was glad the YSL booth was actually our second stop, because I got to show off the fabulous YSL makeup and his application skills for almost the entire show. I’m a minimalist when it comes to my hair. I use clean shampoos that are free of sulfates, parabens, and phthalates. Also, I hardly ever apply conditioner, styling products, or heat to my hair. 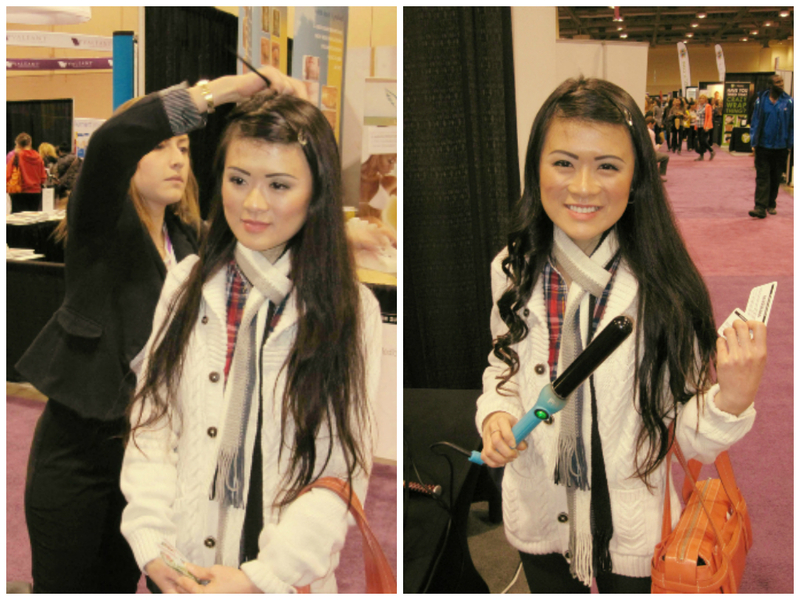 At the show though, I treated my hair to some large loose curls by a woman from Phashion Village. There was so much to see and do that I only had time to curl a quarter of my hair! 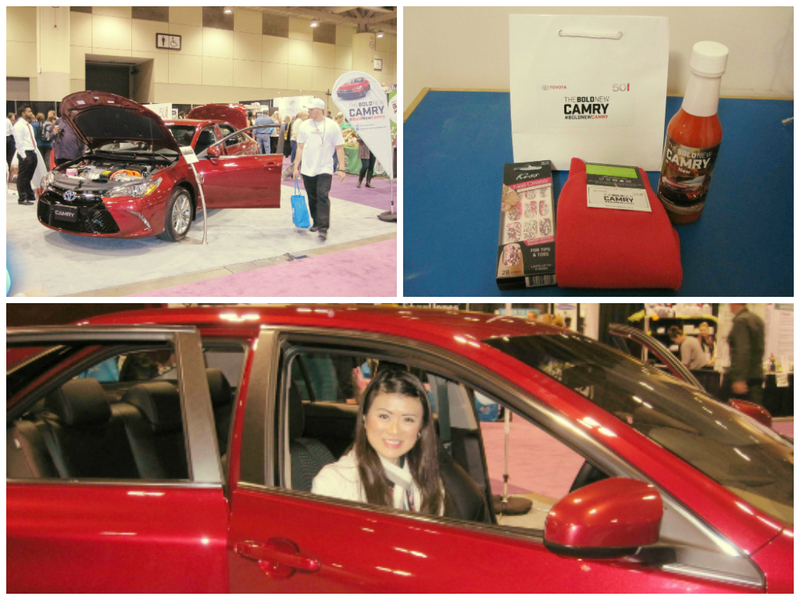 We got to check out the new 2015 Toyota Camry. Afterwards, we received a small gift bag containing a bottle of hot sauce, a pair of red socks, and Sally Hansen press-on nail designs. After SIX hours of walking and exploring every booth, we were exhausted and couldn’t wait to get home to sift through the bags of goodies and samples we received. 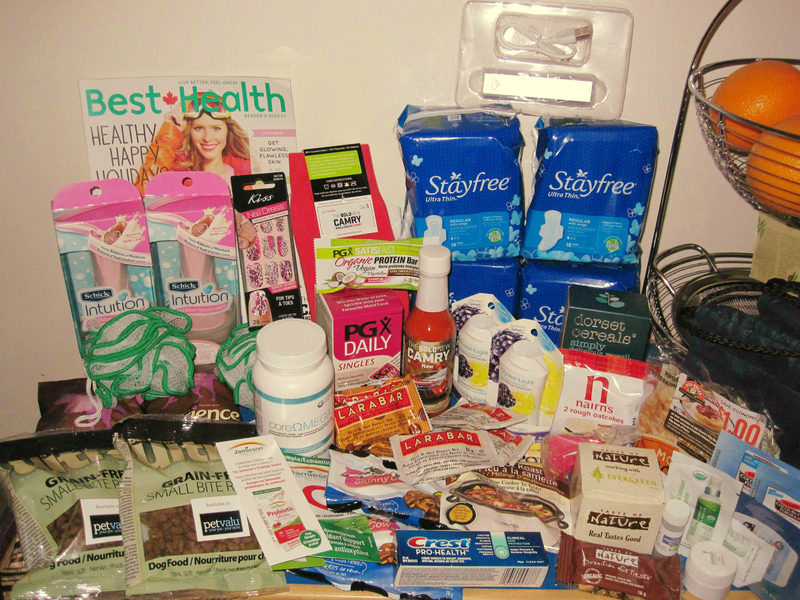 The goodies and samples from this year’s National Women’s Show were amazing! Some of my highlights include: BioCore coreOMEGA omega-3 supplement, Schick Intuition razors, Stayfree sanitary pads, a basil plant starter, and a portable cellphone charger. Congratulations to the National Women’s Show for putting together another successful and super fun trade show in Toronto this year! The next one will be in Québec City this weekend (November 15th-16th, 2014), followed by one in Montréal (March 13th-15th, 2015) and another in Ottawa (April 11th-12th, 2015). If those shows are anything like the one in Toronto this past weekend, I highly recommend checking it out and setting aside at least a few hours to explore everything. Even if you don’t meet any celebrity guests like we didn’t this year, the show is still a blast!